The Mercedes is miles ahead, and in just about all circumstances. While one of its pilots Lewis Hamilton these days has the air of one unstoppable, batting away challenge almost contemptuously. He's won the last five races, and hasn't been beaten since August. 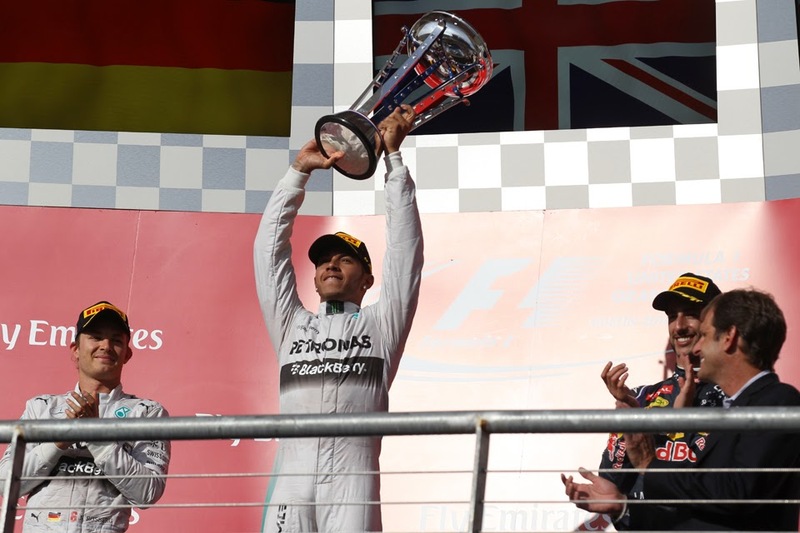 Moreover plenty now are talking about Lewis taking his title number two this year with a heavy sense of inevitability, given that only unusual results can now deprive him. More of the same this weekend? Not necessarily. So, the victor in the Grand Prix this weekend can be taken as read, right? Well, no actually. Or not necessarily at least. This is because there is a conspicuous ray of hope for those looking for a change, not least among them Lewis's slightly on-the-ropes team mate and title rival Nico Rosberg. That if you were to pick a venue in which the unusual is likely to be delivered then the one we're to visit this weekend - Interlagos in Brazil - is probably the one you'd pick. It has an intangible quality - always has - of being a place where things happen, and those things being from almost anywhere on the scale of plausibility. It has good claim to being the closest thing contemporary F1 has to the Bermuda Triangle. History's examples run the gamut: Ayrton Senna's long overdue and highly emotionally-charged home victory of 1991, with just sixth gear remaining in the box, rain falling and shoulders spent; his follow-up win in 1993 when a freak rainstorm on the pit straight wiped out the dominant Alain Prost; advertising hoardings falling on the track in the 2000 qualifying session (one of which was hit by Jean Alesi's Sauber) which caused the session to be ended early; the madcap wet-dry race of 2003, wherein a freak river ran across the track at Curva do Sol, accounting for several cars, and Giancarlo Fisichella was a highly unlikely victor after a big crash involving Mark Webber and Fernando Alonso stopped the race ahead of time (and in what surely counts as an Interlagos special, Fisi didn't know about his win until a week later due to a timing glitch); Michael Schumacher's prodigious ascent through the field in his final race of his 'first' F1 career in 2006 after a gearbox problem in qualifying and then an early-race puncture sent him to the back, with the big finish of him putting the manners on his Ferrari replacement…; the mysterious technical problem that delayed Lewis Hamilton for almost a lap in 2007 and resulted in what looked a certain freshman title slipping through his fingers into the hands of the waiting Kimi Raikkonen; Lewis claiming the title for himself a year later in the most dramatic of circumstances by passing a hobbled Timo Glock at the last corner, depriving Felipe Massa at home in the most heart-wrenching fashion; Nico Hulkenberg blitzing F1's frontrunners by claiming pole in 2010; and then of course the 2012 season's corkscrew final act, which resulted eventually in Sebastian Vettel seizing crown number three. About the only thing that can be expected at this track is the unexpected. -Share Alike 3.0 via Wikimedia Commons - ttp://commons. Quite why this is isn't entirely clear. It's likely in some part related to that the venue is a throwback; narrow, bumpy, with little run off, meaning that it can be unforgiving to error especially by modern standards. It can be tough on equipment too, with many acceleration zones testing gearboxes and engines (and both will be close to the end of their respective lives near the campaign's end). It's the shortest circuit on the calendar on lap time, and its related sense of claustrophobia is heavy. Plenty of other cars, whether you're racing them, lapping them or dodging them for a qualifying lap, tend to be around. Safety cars are frequent - the chance is at around 70% so teams are forever poised for an appearance. Rain also is a regular feature here, and it can arrive suddenly and with varying quantities and timespans. The precipitation forecast for this weekend, and for all three days, looks harrowing. And even the rain can have a seemingly back-to-front logic at Interlagos. One memorable case was that in 2003 and its river, which meant that cars had to run on inters throughout even though for a lot of the way 95% of the tour was bone-dry. Another was in 2012 when only Jenson Button and Nico Hulkenberg twigged that staying out on slicks as the rain fell was somehow the quicker option, and led by half a lap for a time as a consequence. But for the most part Interlagos's ability to provide drama is intangible. Some things just are. Bad news for Hamilton who might more than most would welcome a nice straightforward time of it this weekend. But good news for just about everyone else. Especially Rosberg. Nico too can point to qualifying second here only to the (then) imperious Sebastian Vettel last year in wet conditions, with Lewis down in fifth. However come the (dry) race Lewis sailed past, only to spoil things by drifting into Valtteri Bottas then getting a penalty for it. And more broadly such is the Englishman's towering self-assurance right now that not even Interlagos's worst is likely to daunt him. Based on previous evidence such as that from Japan, even if it does rain the W05 is unlikely to be weak. And as for Lewis he's unlikely to be weak either in such a scenario, as also seen in Suzuka and before. For the reasons outlined strategists tend to look at the Brazilian race as the toughest of the year. And you can add to the confusion this time that the track has been fully resurfaced since the last visit, which means tyre degradation will be a bit of a step into the unknown, as well as has a new pit entrance now with a chicane which alters stop loss time calculations. There's also been some soap opera over the Pirelli compound choice. Initially the medium and hard were picked, like last year, but following criticism mainly from home boy Felipe Massa - variously that the selection was 'dangerous' and unacceptable' - as well as perhaps influenced by the tepid entertainment at Sochi when the same rubber was available and was also on a new surface, the Italian firm blinked and went a notch down to soft and medium. If the rain stays away a multi-stop race can therefore be expected. In any case the relative ease of overtaking and what will likely remain a short pit lane here tends to nudge most towards more stops. While as noted a wet track by no means provides an easy way in to break the Mercedes dominance, the Red Bulls demonstrated in Japan's soaking race that it can match and perhaps beat the silver cars in such conditions. As was the case then a lot would depend though on the pair getting clear of traffic. There may be rain in qualifying too though which should help the Bulls start high. Plus more broadly the team has had Interlagos pretty much to itself in recent years, winning on four of the last five visits (and consoling itself with a mere drivers' championship in the other). Rain and Interlagos has also become associated with Nico Hulkenberg as noted, given his stunning pole lap in 2010 and leading magnificently two years ago, both on a perfidious surface. His form this campaign started well but has been slightly disappointing ever since he drove into his team mate in Hungary, but this may be an opportune moment for absolution. Yet whatever is the case this weekend we can all be glad that it's at Interlagos. 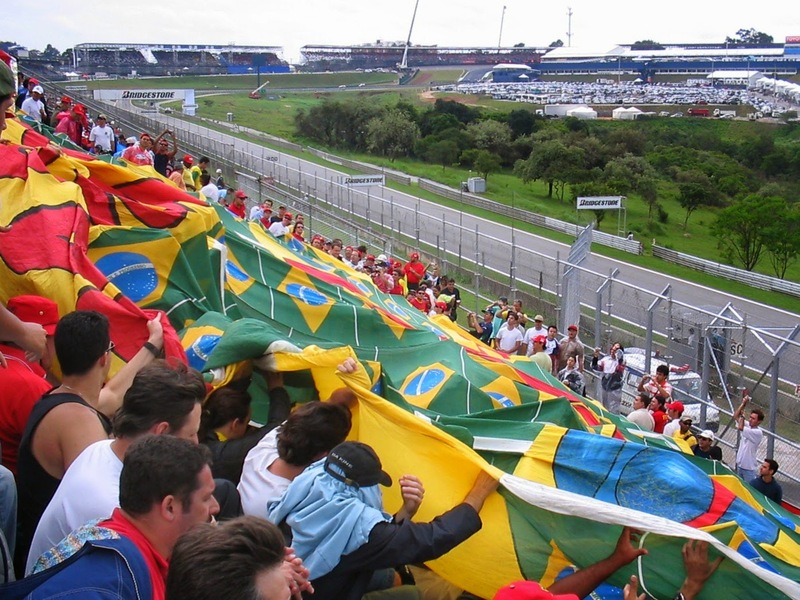 The event always attracts a large, noisy and passionate crowd of genuine F1 supporters, who are able to sit close to the action; overhanging the circuit at some points it seems. This has continued to be the case even in the absence of a consistently front-running Brazilian driver in recent times. It's set in a natural amphitheatre, all contributing to an intense and crowded atmosphere. And although modernity now seems to be catching up even with this place (a new pit and paddock is being constructed on the back straight) its distinction and olde worlde charm remains, as does that it's a track with an organic feel rather than of one coldly created - distinct from those that more and more encroach the schedule these days. It likely will always remain too. In recent weeks Grand Prix racing, at the front at least, has developed something of a sense of the inevitable. But it can be left at the gates this time. This time it's Interlagos.